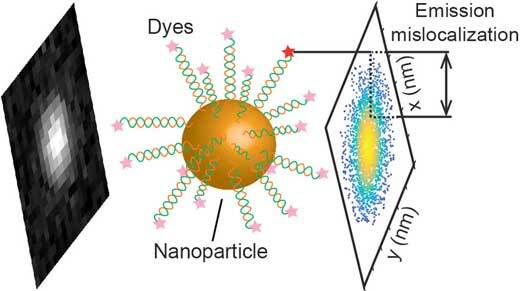 (Nanowerk News) Gold nanoparticles brighten the fluorescent dyes researchers use to highlight and study proteins, bacteria and other cells, but the nanoparticles also introduce an artifact that makes the dye appear removed from the target it's illuminating. Now, a University of Michigan team has determined how to account for the discrepancy between where the fluorescent dye appears to be and where its actual position is (ACS Nano, "Super-Resolving the Actual Position of Single Fluorescent Molecules Coupled to a Plasmonic Nanoantenna"). This graphic shows the artifact introduced when nanoparticles are used to brighten the fluorescent dyes that highlight biologic processes. Image courtesy: Julie BiteenThis graphic shows the artifact introduced when nanoparticles are used to brighten the fluorescent dyes that highlight biologic processes. Image courtesy: Julie BiteenWhen researchers want to understand how proteins interact with each other, how bacteria function or how cells grow and divide, they often use fluorescent dyes. This microscopy approach can be further enhanced with nanoparticles. But an artifact introduced by the nanoparticles makes the dye appear in the microscope as far as 100 nanometers removed from the protein or bacteria to which it is directly bound. This "scooching effect" presents a problem: 100 nanometers may seem like an infinitesimal measurement, but if a protein is itself only a nanometer in length, a researcher might not be able to tell whether a protein is interacting with another protein or just gazing at it from the equivalent of the opposite end of a football field. "For the past five years, we and others have been noticing that the dye, instead of being in the position it appears to be under the microscope, is actually separated from that position," said lead author Julie Biteen, an associate professor in the U-M Department of Chemistry. "The exciting finding we've made in this paper is to measure the distance between where that dye seems to be in images produced by our high resolution microscopes, and where that dye actually is." The chemists' discovery allows them to calculate exactly where a dye is to more accurately pinpoint the position of the protein or bacteria they're studying. This method could help researchers better understand how proteins interact under disease conditions, for example. To better measure the artifact, Bing Fu, who conducted the research in Biteen's lab and is now a postdoctoral fellow at Cornell University, used a somewhat unexpected approach: She surrounded gold nanoparticles with DNA, and embedded the dye within the DNA. DNA has a very rigid structure, Biteen said, so that the dye was sure to stay planted where Fu placed it. Gold is also nontoxic for use in biological applications, and makes a good antenna, which allows Biteen to brighten the dye's fluorescence. Then, the team used a very powerful microscope technique—called "super-resolution microscopy"—to sensitively and precisely measure where the dye seemed to be. This measurement was compared to the actual dye position was in the carefully controlled DNA assembly. This new measurement of the discrepancy between apparent and actual position will allow them to observe the positions of proteins or bacteria relative to each other in future projects. "What I want to be able to do is to detect even a single molecule of protein, so that we can see if just one part of a population is different," Biteen said. "Medically, a lot of disease begins from a very small number of cells or proteins going wrong. With this high sensitivity assay, you might be able to do this kind of early detection with a small signal." Currently, Biteen's lab is using the refined technique to study Vibrio cholerae cells that cause the disease cholera. "We are looking at the proteins that produce the cholera toxin, determining how the cholera toxin is produced under virulence conditions, and thinking about potential therapeutics for cholera," Biteen said.